17 consecutive days of intercessory prayer makes (this) one ravenous. I have done more seeking, studying, and praying about intercession since I started… that is its own blessing. Today’s scripture and prayer for my husband is that his strength might be renewed despite busyness and over scheduling, unreasonable expectations and never enough time…and that the infusion might come directly from The Father. Hmmm…being tapped in to an unlimited source--like getting your coffee with an espresso shot. We are a weary bunch. It’s not just my husband for whom this Word and this prayer were sent. My crew is weary and cranky…but that is not the end of the story. We are weary, and cranky, but not without hope, or a solution. Today is the first day of Lent. It is no accident that my son and I prayed and agreed to be accountable to one another during this season for staying in control. We agreed to rest in Him who is able to strengthen us through His Power in the Spirit, because we are too weak and weary to do it alone. So, today, I am thankful for my Source. I am thankful for Him from whom all blessings flow. I am thankful for my husband, my son who challenges me, and for my daughter, even if she didn’t get a mention this time around. 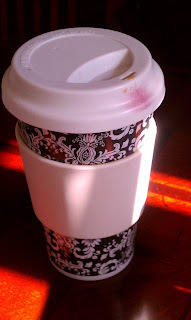 (I am also thankful for coffee, and for the wisdom to know when I’ve had enough.) Thank You Lord, for letting us rest in You (when we are weary, even when we are not), because it is our assurance that God is good. How sweet you celebrate the blessings of your family, in spite of the challenges. I love where you say you are weary but not without hope. Thank God we have him, and we have hope! I wanted to stop by and personally invite you to stop by Lioness Rebirth and join in our blog hop and give-away. This is a great way to celebrate the season. Following you from the World Bloggers Community.